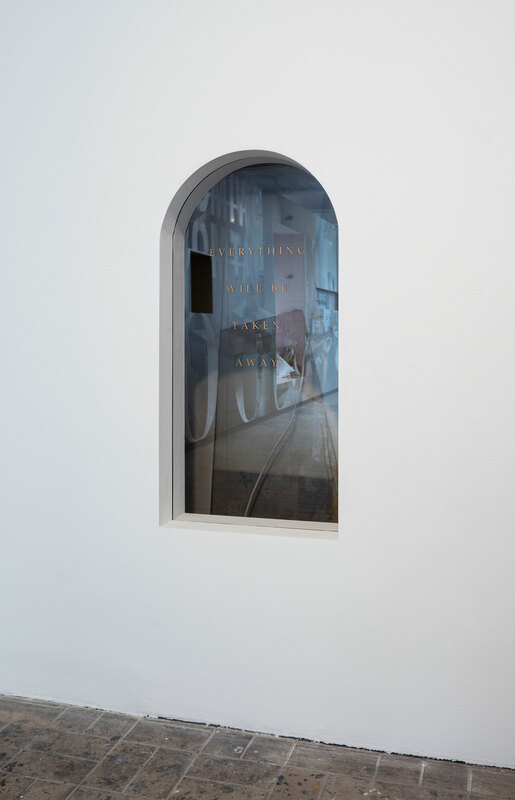 Adrian Piper can be described as a conceptual artist who explores the conventional determinations of rule-based subjectivity and the politics and language of representation. Everything #5.1 is a tombstone-shaped section of wall that has been removed. 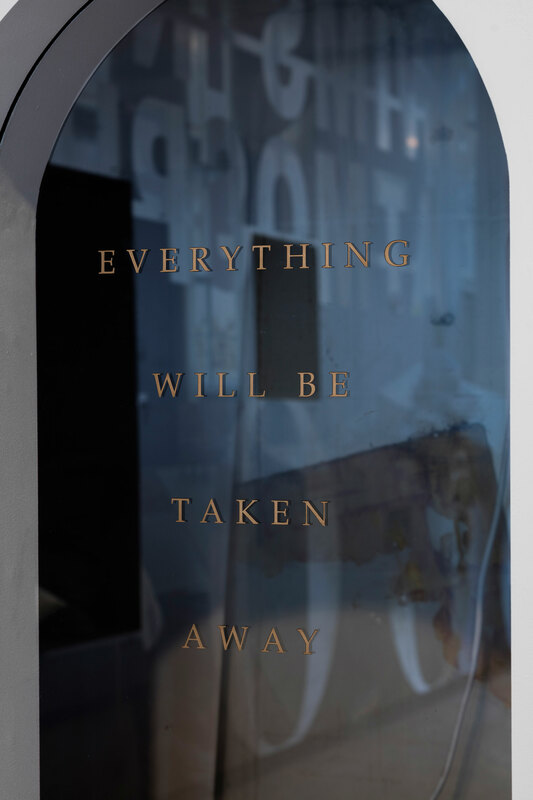 Covering the resultant cavity, a transparent sheet of plexiglass reads, “Everything Will Be Taken Away.” A pared down adaptation of a line from Alexander Solzhenitsyn—“Once you have taken everything away from a man, he is no longer in your power. He is free.”—the statement is a demonstration of a negative understanding of freedom, the equivalent of having “nothing left to lose.” It is the liberty that results once the weight of signage, markers, and labels is removed. 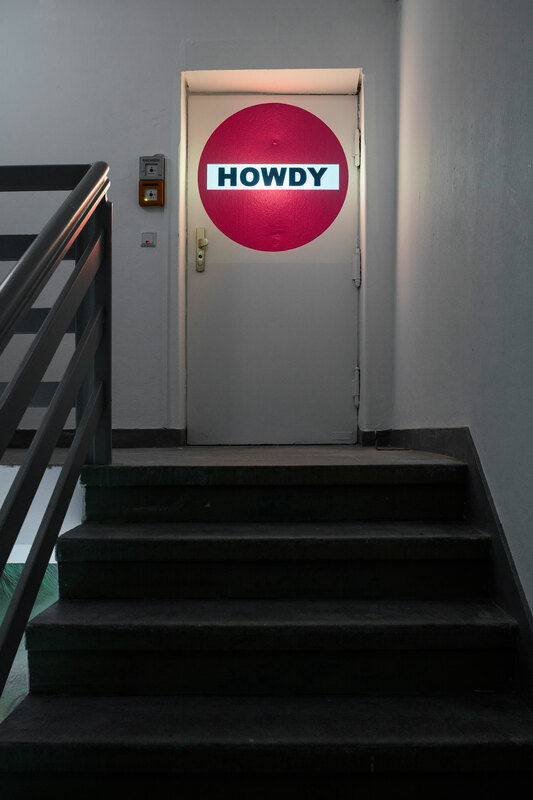 True to her focus on naming and nominal conventions, Piper has constructed a series of projections of red and white no-entry signs placed at dead ends and bearing the word “HOWDY.” The signs, which greet but deter access, present a patent contradiction. The colloquial “howdy,” a greeting (short for “How do you do?”) originating from the southern US, distills Piper’s interest in the realization of the self within and beyond the binds of society. Is this salutation here used as a form of protection, as polite frustration, or as bureaucratic opposition? Through the work we come face-to-face with the double binds that we encounter when we view, when we exhibit, and when we are observed.